I’ve mentioned before that I adore books with unusual settings. Of course, I also noted in my last post, a movie review, that I found a character’s line about aspiring to read but never having time enormously funny because it so accurately describes my life right now. However, the combination of (1) a free Kindle book with an unusual setting and (2) 20+ hours in the car over Memorial Day weekend ended my drought. Ruth Axtell/Ruth Axtell Morren has written a number of books for the now-defunct Steeple Hill single title line, for Love Inspired Historicals, and for Revell—mostly set in 19th century England and Maine. 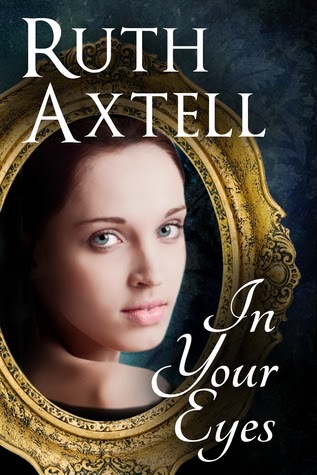 In Your Eyes (written as Ruth Axtell) is available only in digital format and seems to be either self-published or small press published. The setting combines an unusual time period (1641) with an unusual place (Amsterdam). 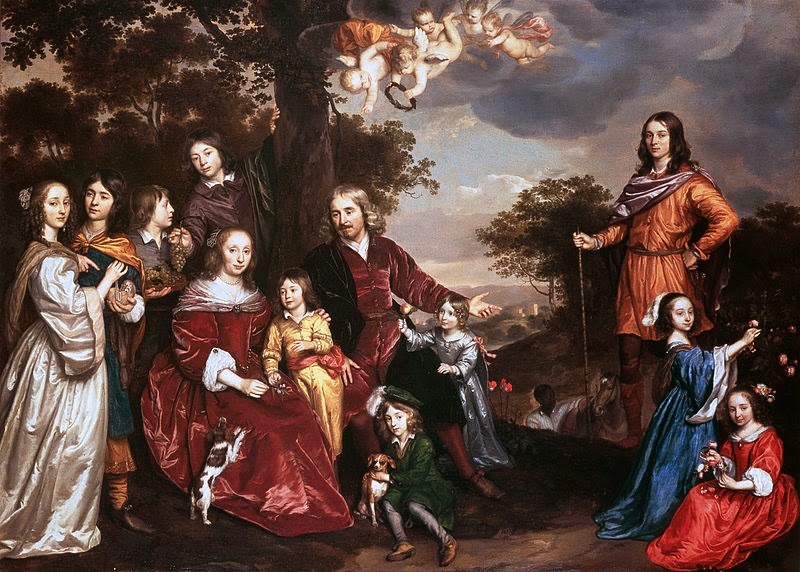 This c. 1652 portrait of the van den Kerckhoven family by Johannes Mijtens provides insight into the fashions popular among the Dutch upperclass during the mid 17th century. The 17th century is a favorite time period of mine. In fact, I, er, know someone (a, um, friend—yeah, a friend) who has an unsold book-of-the-heart set in the early 1600’s that has never been able to find a home in the publishing world. Alas, I seem to be in a minority in my love of 17th century settings, and offerings from the major print publishers are few and far between. Fortunately, the digital age has made niche genres and settings more widely available. In England, the Elizabethan age gave way to the Jacobean monarchs (starting with King James I of the King James Bible fame, whom I wrote a little about here). In the "New World," it was the beginning of English colonization and the makings of modern America. (I wrote about the earliest years at Virginia in my post here and about Massachusetts' Puritans and Pilgrims here. Oh, and be sure to go back and read my post about Bacon’s Rebellion, America’s first “war of independence," here.) The Thirty Years war devastated the European continent during the first half of the century. (Yep, I wrote about that one too.) And in the newly liberated Netherlands, it was the Golden Age. No, no links—yet. That’s what this post is about. When Francesca di Paolo is abducted by a band of brigands on her way home to Amsterdam, little does she realize she will become a pawn in a game of revenge. A budding artist, Francesca is enthralled by her rescuer, Dirk Vredeman, and would love to paint his portrait. Dirk, raised on the streets and surviving by his wits, has spent the last 20 years in the East Indies, where he has amassed a fortune. Now he has returned to Holland to destroy the man who destroyed his mother--the man who is Francesca's guardian, and to whom she owes her loyalty and gratitude. Will Francesca betray Dirk when she discovers the truth? Set in the Golden Age of Holland, the era of Rembrandt and the Dutch masters, the great traders who brought back the riches of the East Indies, and the Amsterdam merchants who speculated with them on the stock exchange, In Your Eyes is a story of love and loyalties, tenuous trust against age-old betrayal. First, a word of caution: I found the sensuality level in this book higher than other Christian romances I’ve read. While the bedroom door is shut, we do get to stand right outside it. If you share your books with young teenagers, you should read the book first and then determine if the content is appropriate for them. That said, I enjoyed the romance. Dirk is an especially tortured hero (of the kind I especially like), and the main characters are well matched. The faith elements are light but pick up near the story’s climax. Though unusual, the setting is well drawn and easily accessible. And because the characters would have been speaking Dutch rather than 17th century English, the author doesn’t have the issue of how much Shakespearean/King James-ish language to incorporate. There is a glossary of Dutch terms which are sprinkled lightly throughout. However, the glossary is at the end of the book, and since I was reading a digital version, I didn’t find it until I’d finished. Since I’d just recently read a book set in the Netherlands (and given the fact I grew up in a Dutch-settled Midwestern town), I didn’t have any difficulty on that front. For most people though, I think it would be helpful to know about the glossary when they start the book. My one complaint is that I didn’t get as good a feel for the time period. (Have I mentioned I kinda like the 17th century as a setting? Oh, I did?) The focus on the 17th century Dutch masters is well incorporated. However, the Thirty Years War would have been happening at this time, and it was not mentioned at all that I recall. I also expected to see some mention of the how the “tulipmania” episode several years before the book begins would have impacted the characters’ feelings about stock market speculation. Overall though, this is a good addition to anyone’s non-Western, non-Amish, non-Regency historical library. In Your Eyes is currently available for $3.99 on Amazon. I did not see it at Barnes and Noble or other online bookstores. Do you have any non-Western, non-Amish, non-Regency settings you'd like to find? Or any books with such settings to recommend? P.S. In honor of the 70th anniversary of D-Day today, I'm also including a link to a non-Inkwell article I wrote last year about a local Pearl Harbor survivor. Chief Brewer died about a month after the article was published. I enjoy Ruth Axtell's books and I got this book free a few weeks ago. I haven't read it yet (yes, my TBR pile is becoming crazy) so thanks for the review, it helps me know what to expect! I really enjoyed the history lesson, CJ. Welcome, Lis! I'd say the important thing to remember is that the glossary is at the back in case you run into any terms you want to look up. Thanks, Suzie. I love history -- betcha didn't know that, huh? I really like Ruth Axtell's books but haven't got this one yet. Thanks for the great review, CJ. Anita, I've read a number of her other books. I can't remember the level of sensuality in the Steeple Hill single titles, but I think this one is higher than in the Love Inspired Historicals I've read. DeAnna, I learned more history from my fiction reading than I ever learned in school. I loved the old sweet Harlequin Historicals from the 80's. They were short (length of the contemporary Love Inspireds) and had such a wide variety of settings compared to most books today. (Czarist Russia during Napoleon's invasion, Spain during the Christian reconquest from the Muslims, Revolutionary France, etc.) Hope those authors did their homework! Excellent review, C.J. My husband's mother's family is Dutch, so this sounds interesting!